What’s been bugging me and making me smile lately? Let’s find out… (did that read as cheesy as it sounded when I read it out-loud? Yeah). Rave: Time. I have so much more time in my life at the moment. When I worked in Basingstoke it would take at absolute best 40 minutes to get home. But that was from sitting in the car in the carpark to parking my car in the garage. From my new office in Portsmouth (incidentally the same location as the Lakeside parkrun and also the D Day 10k I did back in June), from being in my office to standing in my flat it takes 25 minutes. It literally takes 15-20 minutes to drive there. THIS IS INCREDIBLE. For over five and a half years I have driven up and down the M27 and M3 and more times than not it will take me over and hour to get home. OK yes it is currently school holidays so the roads are quieter, but even still if it takes less than hour from door to door I will be over the moon. Alfie doesn’t know what’s going on. He’s dead asleep when I get in. And, similar to my last job, the working hours are fairly relaxed. Obviously you make sure you do your core hours and necessary tasks over the week but you can come in earlier or later and then correspondingly leave earlier or later. It’s fantastic. I think offices like this are far more realistic to how people want to work (obviously I know not all workplaces can or should do this but for a lot of office-based work it makes a lot of sense). It gives a good level of morale. Rave: OK, OK one more rave about my new job. Every Friday they have a mini food festival on the field outside the office. EVERY FRIDAY. When I heard about this I had to swallow down a squeal (can’t let all the craziness out on the first week, of course). Sadly I’d already brought lunch with me but decided to venture downstairs and see what was on offer for future Friday lunches. Well, they had Caribbean food, Mexican food, pizzas, some American-style BBQ… and cakes. Oh the cakes. I stood there for too long and caved under the might cake pressure. I had to get myself a rocky road slab. And I say slab because it was HUMUNGOUS. Rant: I had a car accident on my second day driving into work. It was my fault and it was very stupid. Luckily no one was injured. I was in a queue for some traffic lights and we’d stopped. I then saw the lights go green ahead and I went forward…straight into the still stationary car in front of me. Completely my fault for not checking the car RIGHT IN FRONT OF ME. Luckily the man I drove into was very nice and didn’t yell at me. He calmly asked for my details and told me (after I’d apologised about a zillion times) that in the great scheme of things, it wasn’t that big an accident. No one had died or been badly hurt. So my little Fiat 500 is at the garage getting fixed and I have a little Citroen C1 and a £250 excess to cover. I’m trying not to think about how much my insurance will be when I renew it at the end of the year…*Sighs* you live and learn. Life was clearly going far too well for me currently! Rant: Turning up to my gym (luckily a bit later than my usual 5.30am, I think it was about 6am) to find that the fire alarm was going off and everyone was stuck outside waiting to go back in. Thankfully it was an error and luckily it was quite mild…in the middle of winter I would not have been amused. It was fairly cool to see a fire engine show up and a load of firemen ‘save the day’. Made for an interesting morning anyway! My mum was so proud! Rave: And a final rave…I was sent a crafty little hand-held device, called Zap-It!, which helps stop you itching when you get attacked by mosquitoes and bugs. Basically it generates a low, electrical impulse when clicked against the bite and what this does is reduce the histamine flow and stimulate capillaries, which flushes out the toxins (that make you want to itch). The shock is really very small so not painful at all. Not like that HORRENDOUS Tough Mudder electric shock obstacle, dear God. It can also be used up to 1,000 times (the poor soul who gets 1,000 bites…). A great addition to your essential gear for BBQ’s, festivals and of course any trail races! You can buy it in lots of chemists and supermarkets or online. What are you ranting and raving about this week? What’s most important to you about the environment you work in? Today I have a guest post regarding on the subject of cars (ooh er, bit different for me!) and the best one for your personality and needs. You cycle to work, take the stairs instead of the lift, drink plenty of water, hit the gym five times a week, and always get your five-a-day – or at least you try to. If this sounds like you, you’re a bona fide fitness fanatic and a new car is never likely to be top of your list of priorities. The trouble is, when it comes to cars, your needs are very specific – not only do you need something big enough to fit all of your weekend sports equipment into, it could do with being good on the gas for those trips to the coast and probably have four-wheel drive for when you venture out into the wilderness. This is the model that has arguably come to define the crossover and SUV class and is an outstanding all-rounder with an excellent driving position, great handling, and surprisingly low running costs. Inside, it has enough room for a full five-a-side team (including subs if you opt for the +2 version) a versatile boot with a fully adjustable shelf and a reversible floor with a wipe clean surface that’s perfect for muddy boots or sandy wetsuits. The Skoda Yeti is a firm favourite among families and outdoor types alike as it is as adept at the school run as it is a cross-country run, particularly if you plump for the four-wheel-drive model. And despite being one of the few crossovers that looks more like a good, old-fashioned estate car than a scaled down traditional 4X4, it handles the great outdoors better than most and is equally at home in a muddy field as on a motorway. It has a versatile interior in which the rear seats create extra load space by moving independently or coming out completely. If the Qashqai and the Yeti look a little too run-of-the-mill, then look no further than the Citroen C4 Cactus – although it has no 4X4 option, it is chunky, has a relatively high wheel clearance and ‘Airbump’ panels on the sides that protect the body work from all sorts of scrapes. It’s economical – some models promise up to 90mpg – and has a spacious interior and a good-sized boot. Not one for the off-roaders, but certainly a great option for those who like to stay on the beaten track. If you’re looking at the higher end of the SUV market then you need look no further than the Range Rover Evoque – it has all the handling and power you’d expect from a Range Rover, but with some seriously good looks and luxury interior. In short, you can take this car absolutely anywhere – it’s just as at home tearing across an open field as it is pulling up outside an expensive restaurant. And although they don’t come cheap, they do hold their value remarkably well. If you want a crossover with a little more refinement than a Nissan, a Citroen or a Skoda can offer, but can’t stretch as far as an Evoque – then the Q3 SUV is the car you’re looking for. It re-houses the best of the A3 hatchback in a study SUV shell with an elevated driving position and a plush interior. And although it’s not as fuel-efficient as the others on the list, it’s great to drive and has bucket loads of space. There’s even an RS model if you prefer your ride to have a bit more power and excitement. Whether you prefer the down to earth ruggedness of the Yeti, or the refined thrills of the Evoque, the crossover you drive says a lot about your personality – find out exactly what your car says about you in the We Buy Any Car Personality Quiz. What do you look for in a good car? I’ve had four days off and yet I feel like I’m even more tired. We’ve just been crazy busy. But in a nice way. Ben and me had Thursday and Friday off as we had a wedding Thursday afternoon and were staying the night in the hotel where the reception was being held. On Thursday morning we tried to get some boring house jobs done and also sort my new car out (very exciting!) Then we headed to the wedding, which was being held in the Spinnaker Tower in Portsmouth. Basically it’s this huge tower-like structure where you can go up in a lift and see amazing views. Well, I say amazing…it’s about as amazing as it can get in Portsmouth 😉 Because we got there about 40 minutes before the wedding began we waited in the cafe and had a sneaky bit of cake. We had a slice of carrot cake and millionaire shortbread and had half each of both. This is big news as I never normally share cake! Despite the weather being less than stellar, the views were fantastic. It was really quite a unique and lovely ceremony. And there was a glass floor you could stand on (without shoes) and look straight down. Very cool. After the ceremony we headed back to the hotel for the reception. Despite my previous cake, I was getting hungry. The meal was a buffet and in true Anna fashion I started getting antsy. I hate buffets. I’m always scared they’ll not be enough food – and consequently eat way too much. When will I ever learn? Ben said he thinks it’s hilarious, but I tried to make him understand by saying imagine that the bar was a buffet format and there were only so many drinks available. His eyes lit up in panic. Exactly! I ate quite a lot of sweets from the sweet buffet too…and three *little* pieces of wedding cake. I felt quite full by the end. And rather rough. It was a good evening though with lots of great company and banter. I woke up feeling a little delicate and quite bloated. Not good! Then we had a mad whirl-wind of a day where we had to dash back home to Southampton to pick up my paper bit of my driving licence to then drive back to Portsmouth to sort my new car out. We’ve officially bought a new Fiat 500! And amazingly it’ll be ready this week as they had one in stock to the spec we wanted. How lucky is that?? Then from there we had to go home, do the food shop, go to the post office and pick up our road bikes from Halfords. And I wanted to do a bit of baking for a party I was going to the next day. Whew. 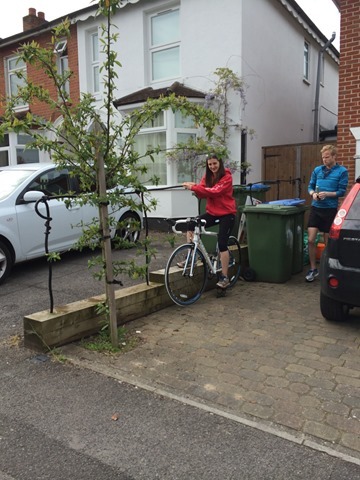 As we don’t have a bike rack we could only get one bike safely in our car so I cycled mine home (it was only 4 miles). It was great to get a proper feel for the bike. It felt really good. It fit well, I felt very comfortable and it was light and speedy – from my limited experience! Unfortunately we don’t have anywhere to put them yet as our shed is rather full. So they’re in the living room for the moment. Looks fine, right…? Alfie doesn’t even care. Next weekend is the Netley 10k which is our running club championships (lots of medals up for grabs for different achievements). I’ve eaten so much rubbish the past few days (yep, I include cake in that) that I’ve decided to go on a bit of a ‘detox’ this week. I say detox but what I mean is a ‘cake and rubbish free zone’. No cake, chocolate or ‘big’ treats until I finish the race. I feel like I went overboard the past couple of days and I want to get back to feeling good and in race shape! What’s your car like? I’ve never had a new car so this is very exciting. I will be cleaning it every weekend…maybe. How do you deal with a weekend or few days of eating rubbish?